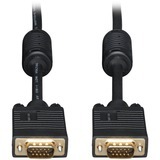 Tripp Lite's 6-ft. SXGA/UXGA Monitor "Y" Splitter cable provides an inexpensive alternative for splitting the video signal from your PC's VGA port to 2 High-Resolution monitors that use standard 15-pin plugs. 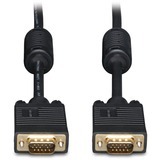 75-ohm coax conductors used for RGBHV signals allow for use with monitors with up to 1600 x 1200 resolutions. 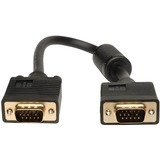 Perfect for laptops to display on a separate, larger monitor. Use for short distance applications only. 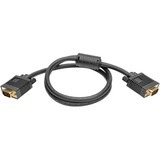 For applications that require longer distances and highest resolution, see Tripp Lite B114-002-R, powered 2-Port Splitter, or,B114-004, powered 4-port Splitter. 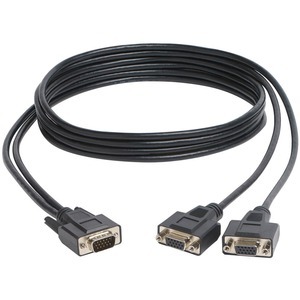 To extend your desktop onto a second monitor, see Tripp Lite U244-001-VGA-R.